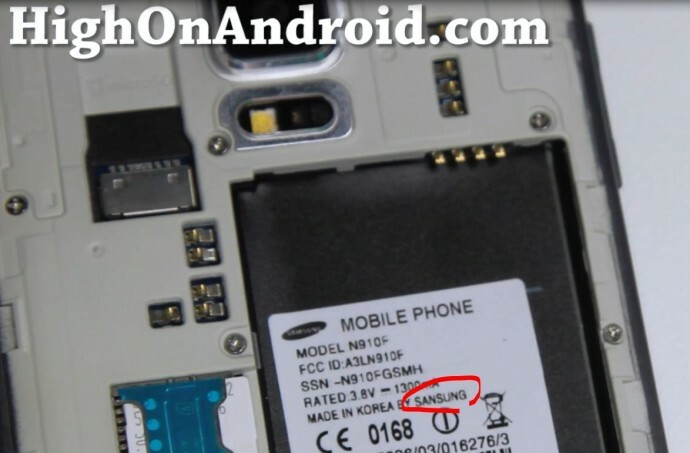 How to Spot Fake Galaxy Note 4! For those of you who are shopping online on eBay or maybe in offline retail store, you may want to be aware of fake Galaxy Note 4 phones that look exactly like a real one. Worst, if you are not tech-savvy, you may end up using these fake Note 4 phones for months without realizing it’s fake. The fake Note 4 actually bring you many of the features of a real Note 4 but your experience much degraded by cloned software and MediaTek CPU which is many times slower than the real Qualcomm Snapdragon 805 processor on a real Note 4. So, how do you spot a fake Note 4? First, be aware of Note 4 model numbers with N910 and SM-N910F. If the box shows just “N910” as model number it’s fake as the official model number on the box should have “SM” in front and additional character trailing it like “SM-N910F” (For T-Mobile, it’s SM-N910T, Sprint is SM-N910P, Verizon is SM-N910V, and AT&T is SM-N910A). Second, if you take a look at the back of the phone (with the back cover and battery out), you will see “Made by Sansung” instead of “Made by Samsung”. Third, if you look under Settings->About Phone, you will see Baseband version starting with “MOLY” and also “Custom Build version” as i9228. Fourth, your camera app should have settings for 4K and 1080P video. On a fake Note 4, you will only see low, medium, and high quality settings. Fifth, if you power off your phone and hold down Volume Down, Center Home, and Power buttons for 3 seconds, you should see ODIN Download Mode, which also specifies the real model number of your Note 4 on top-left of the screen. If you don’t see this and see some Chinese characters, you know it’s fake Note 4. There’s probably even more things you will notice with fake Note 4 but if you see any of the mentioned features of the fake Note 4, you will want to avoid it. I simply cannot believe there are still numerous sellers on eBay fake-bidding fake Note 4 phones to gullible smartphone buyers who may never find out they bought a fake phone for many times it’s worth. For example, these fake Note 4 can be bought on AliExpress.com for around $150. That means I made the seller $350 in profits by buying at $500! That profit may be a lot more than what Samsung actually makes on each phone! Overall, it’s disappointing many Chinese companies decide to make clone phones, the Chinese government should step in and regulate these fake companies. It’s unfortunate that companies like this spread bad image to China, I’ve even seen fake eggs being exported from China. The worst is that these fake phones promote scammers/scams to happen. If they didn’t exist, scammers couldn’t scam people. Buyers be aware, make sure you buy a genuine smartphone, I do not recommend any fake/clone smartphones as they are usually poorly made and will break within months. You will end up spending more money in the long run if your fake Note 4 breaks so just buy the real thing or something that suits your budget. There are plenty of great older model phones I can recommend that are still plenty capable like even the Note 3. I agree with you regarding E Bay selling fake devices at very high prices. But, apart from an HTC device all my smartphones have come from China over the last 4 year. My current one bought for 80 Euros is the best smartphone I have ever had….. Quad-core, DUAL-SIM, 2 X 4.3 AmpHr batteries, excellent case that allows apps through the cover screen, e, g. camera, without loggin in. It’s fast with good quality sound and good build quality. The only downside is that viewing outside is not good. There is no deceit as they are obviously copies of something. Enjoy the malware that come with your cheap chinese android phones. I just watched your video on youtube, i am sorry to hear bout that, hopefully u kan get your money soon. Its pretty messed up how ppl can sell fake devices online. One time i ordered a micro sd samsung card 64gb and turned out to be fake once i looked at it. I contact the seller and told me its genuine microsd 100% authentic. Which was lies, and i bought it for $26. I thought it was real because so many was sold. But i told the seller i am very dissapointed on the itemand that i was gonna contact ebay, and with no struggle he quickly refund my money within seconds. I believe because he has a 100 positive feedbacks and dont wanna lose his reputation. I left him a neutral feedback. But yes now a days ppl are getting smarter on making replicas or fakes to sell online. Hope for the best my friend, and i will end this here.. I been a biggest fan of your channel and keep up the awsome work. Getting my galaxy vr soon as well thanks to you!! Have a great day and happy new years!!! I wish I’d known all of these signs to look for 2 days ago. Since booting into download mode gives back all chinese writing, I don’t know how to root, if that would even help. What are the author’s thoughts on this? Just curious though, did your Gear VR work with the fake Note 4? Since I also unfortunately got a fake note 4, I thought I might as well make use of it with the Gear VR. Thanks! I am also a victim of a knock off/fake Note 4!! !…I feel so stupid! !..I bought on the streets of Costa Rica! !…Should have know better!…But cheap talks, thinking you had an expensive phone worth at least $700!!…NOT!! !….If it is too cheap to believe, probably a FAKE, right?…. Anthony at least you didn’t pay $500 for yours. A dude on craigslist sold me the fake I have for $500. Now I’m broke and stuck with a crappy phone. I fell victim to this as well. Could you tell me what you did with your device? Did you trash it or send it for recycling? I contacted the seller, and he said that he didn’t know the phone was fake when he got it since he exclusively used iPhones and wanted to use the money to get the iPhone 6+. I contacted the sheriff, and the only way they can help is by me filing a police report. Credit cards and paypal protection, that’s the way to go. If a deal is too good to be true, it usually is. Previous story Nexus 6 Unboxing!